The far side of the moon, photographed by the Chang'e-4 lunar probe, is seen in this image provided by China National Space Administration, Jan. 3, 2019. The Chinese Jade Rabbit 2 rover is making tracks on the soft, snowlike surface of the far side of the moon. The rover drove off its lander’s ramp and onto the lunar surface late Thursday, about 12 hours after the Chang’e-4 spacecraft made the first-ever landing on the moon’s far side. This picture taken Jan. 3, 2019, and received, Jan. 4, from the China National Space Administration (CNSA) via CNS shows a robotic lunar rover on the far side of the moon. China’s space agency posted a photo online, showing tracks the rover left as it departed from the spacecraft. “It’s a small step for the rover, but one giant leap for the Chinese nation,’’ Wu Weiren, the chief designer of the Lunar Exploration Project, said on state broadcaster CCTV, adapting American astronaut Neil Alden Armstrong’s famous message “That’s one small step for [a] man, one giant leap for mankind,” when he stepped onto the lunar surface July 20, 1969. “This giant leap is a decisive move for our exploration of space and the conquering of the universe,” Wu Weiren said. The Jade Rabbit 2 rover has six individually powered wheels, so it can continue to operate even if one wheel fails. It can climb a 20-degree hill or an obstacle up to 20 centimeters (8 inches) tall. Its maximum speed is 200 meters per hour. The United States, the former Soviet Union and more recently China have sent spacecraft to the near side of the moon, but the latest Chinese landing is the first on the far side. The probe will conduct astronomical studies and surveys of the surface’s mineral composition and radiation tests of the surrounding environment. Shortly after landing, the Chang’e-4 sent a photo of the lunar surface to the Queqiao (“Magpie Bridge”) satellite, which was launched last May in the first phase of the historic mission. The Queqiao satellite is deployed about 455,000 kilometers from Earth, where it will relay communications between ground controllers and the Chang’e-4. This is China’s second probe to make a soft-landing on the moon, following 2013’s Jade Rabbit lunar rover mission. Beijing plans to launch a third lunar rover, the Chang’e-5, later this year, which is expected to collect samples from the moon’s surface and bring them back to Earth. 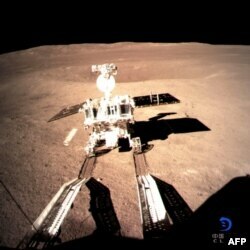 The unmanned lunar missions are part of China’s ambitions to join the United States and Russia as a major space power. Its plans include establishing a permanent manned space station, a manned lunar landing, and eventually probes to Mars.